What a journey we have undertaken together. A full year’s worth of uncertainty, close calls, and other things I might have been able to talk about if this weren’t the pre-spoiler-warning header. Whatever else happens today, we’ll always have the adventures we lived in parts one, two, and three. Beyond that? Who knows. AS ALWAYS, BE WARNED. HERE DWELL THE MOST ALL-ENCOMPASSSING, EVERYTHING-RUINING, SECRET-DEVOURING SPOILERS. Back in the day, our game group used to hold these little house tournaments all the time. Mostly Summoner Wars, though we could be counted on to make a lively competition out of nearly anything, from Omen: A Reign of War to The Duke. If we could play more than one match at a time, sharing table space and laughing about each other’s flubs, we were set. Then, for whatever reason, we stopped playing like that. Over the next year we occasionally discussed giving it another shot. 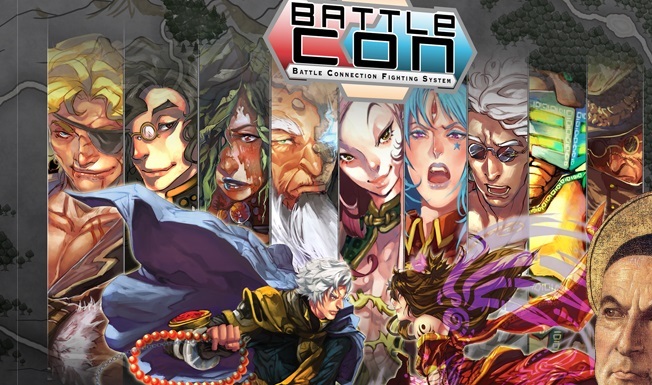 Especially if we could hold a tournament using BattleCON: Devastation of Indines, because a colorful fighting game full of thirty asymmetrical characters, dead simple rules, and outguess-your-opponent gameplay seemed like the perfect sort of thing for a winner-takes-all brawl. Even so, our plans never coalesced into an actual event. Well. A few weeks back, entirely unexpectedly, we were treated to a perfect situation: exactly eight players, all of whom arrived exactly at 8, nobody who reported needing to get to bed early, and every single one of them ready and willing to play. Here’s the drill: as started in the previous installment, my gang of puckish rogues has been playing through Risk Legacy and surviving to tell the tale. However, we’re telling everything, and Risk Legacy is one of the few board games in existence that actually suffers when spoiled — so take heed, because today we’re looking at how the game changed when we triggered the opening of a pair of the envelopes taped to the inside of the box, and once you know what’s inside, there’s no going back. (A) Those who flavor their poison with a heaping dose of nostalgia. It’s okay, I’ve done it too. (B) Those who are wrong and/or new to the world of board games. (C) Those who like Risk Legacy. Risk Legacy has been out for a while, and I’ve avoided talking about it because to talk about it is to, well, ruin it. Still, it’s been out for almost two years, and its creator, Rob Daviau, has recently announced SeaFall, a spiritual successor that will have the benefit of being born apart from the series-mishandling clutches of Hasbro. Which is to say, it now feels like time. Time to talk about Risk Legacy, about why it’s possibly the single most innovative board game to come along these last couple decades. Though be warned: while this first installment won’t spoil anything important, future accounts will chart my group’s course through Risk Legacy’s fifteen successive battles, and may very well become more illuminating than someone looking to experience Risk Legacy for themselves might like. This is a game best experienced firsthand; this series is for everyone else, who knows they won’t get that chance. You’ve been warned. For such a “quiet year,” our people have endured a whole lot of clamor across the last three seasons. The mounting tensions (and Bazongas!) of spring. The fracturing of our family over the summer. And more recently, the reappearance of our greatest enemy during the autumn. When last we played The Quiet Year from Buried Without Ceremony, the few remaining members of our community had decided to migrate south for the winter, both to make a new home in a bunker we’d discovered and to hide from the pitiless leeching of The Jackals. There are a lot of questions on everyone’s minds. Will our enemy overlook us? Will Short Red prove a better leader than his father? What happened to our brothers and sisters who fled Grandfather Tall Red’s reign of terror? The only thing that’s absolutely certain is that, at some point during the coming harsh months, the Frost Shepherds will appear and spell the end of our family as we know it.